The 2013 season went badly for most of the National League West. Only the Dodgers prospered and, if we subtract that 42-8 period, it wasn't so great for them, either. But the Dodgers are back with obviously the strongest team in the NL West for 2014, according to the 2013 WAR values of their 2014 players. 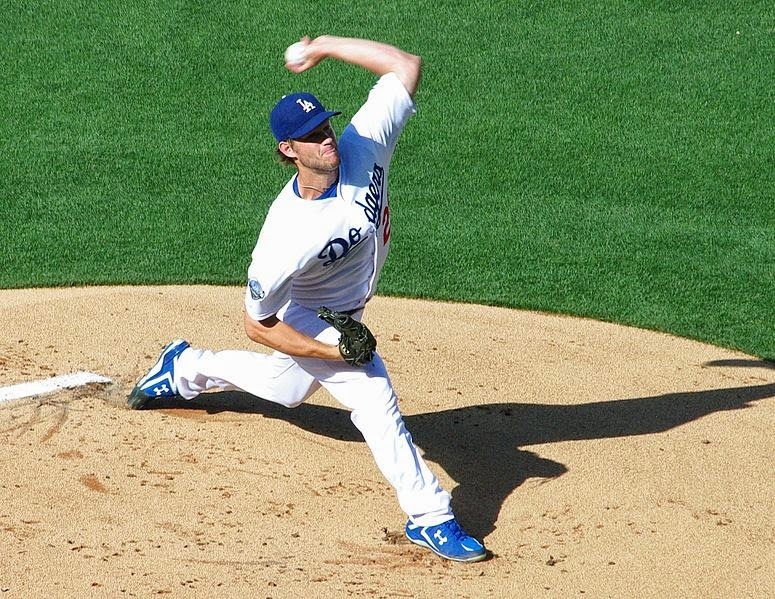 By WAR, Dodgers pitcher Clayton Kershaw was the best player in the NL West for 2013, carding a 7.9 (kla4067/Creative Commons Attribution 2.0 Generic license). If we're just looking at 2013 player value, there's no one else to look at but the Los Angeles Dodgers in the National League West this season. If we're just looking at payroll, it's the Dodgers, who hold the new all-time record at $234 million. If we're just looking at 2013, it's the Dodgers. The Dodgers certainly have areas of vulnerability, but they have no match within the NL West. Top-half position players — 1B: Adrian Gonzalez, 10, 3.9; SS: Hanley Ramirez, 2, 5.4; 3B: Juan Uribe, 7, 4.1; RF: Yasiel Puig, 3, 5.0; C: A.J. Ellis, 12, 2.3. Totals: five players, 20.7 WAR. Second-level position players — Andre Ethier, 90, 2.7; Carl Crawford, 154, 1.8; Scott Van Slyke, 214, 0.9; Justin Turner, 215, 0.9. Totals: four players, 6.3 WAR. Top-level pitchers — Clayton Kershaw, 1, 7.9; Zack Greinke, 25, 3.9; Hyun-jin Ryu, 37, 3.3; Kenley Jansen, 62, 2.6; J.P. Howell, 118, 1.6. Totals: five players, 19.4 WAR. Second-level pitchers — Paco Rodriguez, 126, 1.5; Jamey Wright, 188, 0.9; Chris Withrow, 214, 0.7; Brian Wilson, 230, 0.6. Totals: four pitchers, 3.7 WAR. With three starting pitchers among the top 37 by 2013 WAR, the Dodgers are loaded in front of their pitching staff. With six relievers on this list, they are loaded in their bullpen. Who would have ever thought the Dodgers would put four outfielders on these lists, and none of them would be Matt Kemp? These categories show us that the Dodgers still have areas of need, particularly second base, where they are trying Dee Gordon at the moment. But they still have fewer holes than anyone else around. Second-level position players — Mark Trumbo, 125, 2.2; Cliff Pennington, 151, 1.8; Aaron Hill, 198, 1.1. Totals: three players, 5.1 WAR. Top-level pitchers — Patrick Corbin, 57, 2.8; Bronson Arroyo, 66, 2.5; Brad Ziegler, 109, 1.7. Totals: three pitchers, 7.0 WAR. Second-level pitchers — Wade Miley, 135, 1.4; Addison Reed, 161, 1.2; J.J. Putz, 197, 0.9; Josh Collmenter, 200, 0.9; Will Harris, 206, 0.8; Matt Reynolds, 219, 0.7; Trevor Cahill, 225, 0.7; Joe Thatcher, 231, 0.6. Totals: eight pitchers, 7.2 WAR. This everyday lineup has nice depth, though the Diamondbacks need a big bounce-back season from catcher Miguel Montero, barely a replacement player last year with 0.1 WAR. Also, Cody Ross is out of the picture right now as he tries to come back from a nasty hip contusion. The starting rotation is weak, especially with Corbin missing the entire season with Tommy John surgery. Fortunately, the Diamondbacks signed Bronson Arroyo, who was about as good last year. Top-half position players — SS: Troy Tulowitzki, 3, 5.3; 3B; Nolan Arenado, 3.9; LF: Carlos Gonzalez, 2, 5.0; C: Wilin Rosario, 13, 2.3. Totals: four players, 16.5 WAR. Second-level players — Michael Cuddyer, 137, 2.0; Justin Morneau, 138, 2.0; Brandon Barnes, 159, 1.7; DJ LeMahieu, 179, 1.4; Charlie Blackmon, 224, 0.8; Corey Dickerson, 230, 0.7. Six players, 8.6 WAR. Top-level pitchers — Jhoulys Chacin, 9, 5.9; Jorge De La Rosa, 19, 4.3; Tyler Chatwood, 33, 3.4; Adam Ottavino, 78, 2.2. Totals: four pitchers, 15.8 WAR. Second-level pitchers: — Wilton Lopez, 195, 0.9; Boone Logan, 225, 0.7; Matt Belisle, 239, 0.6. Totals: three pitchers, 2.2 WAR. There is some talent here. The Rockies have 10 position players between the two position player lists, where the average club would have eight. And, because WAR accounts for park factors, these players aren't inflated by Coors Field. The Rockies should score some runs. The Rockies have three All-Star level performers in Tulowitzki, Gonzalez and Chacin. They've got value throughout the lineup. Behind Chacin in the rotation, the Rox are in good shape with De La Rosa and Chatwood, but they could use a couple more. The bullpen has some nice performers, especially Ottavino. It doesn't seem that there's quite enough here. In particular, there's to be no obvious relief closer. But this is a decent club that could rally to a playoff spot, if all breaks right. Top-half position players — 2B: Jedd Gyorko, 2.2; SS; Everth Cabrera, 11, 2.8; 3B: Chase Headley, 11, 3.4; RF: Chris Denorfia, 6, 4.3; CF: Will Venable, 15, 3.2. Totals: five players, 15.9 WAR. Second-level position players — Carlos Quentin, 140, 2.0; Yonder Alonso, 189, 1.2; Nick Hundley, 211, 0.9; Tommy Medica, 225, 0.8. Totals: four players, 4.9 WAR. Top-level pitchers — Joaquin Benoit, 53, 2.8; Andrew Cashner, 70, 2.4; Alex Torres, 96, 1.9. Totals: three pitchers, 7.1 WAR. Second-level pitchers — Tyson Ross,155, 1.3; Nick Vincent, 170, 1.2; Huston Street, 183, 1.0; Eric Stults, 210, 0.8. Totals: four pitchers, 4.3 WAR. As always under manager Bud Black, the Padres have to pitch, run the bases and play defense. They can put a lineup together just from these lists, which is more than some other last place clubs from 2013 can say. However, the game does involve hitting, and the lack of a big bat is poison, even if the Padres are playing in a pitcher's park. When you play in a pitcher's park, though, it helps to have pitchers, and the Padres are short on pitchers who can take the ball at the start of the game. Andrew Cashner is a big arm in front of the rotation, but he only has 33 career starts, including the 2014 opener against the Dodgers, and there's not much behind him. The bullpen has some achievement between Benoit, Torres, Vincent and Street. However, the last couple spots in the rotation and the bottom shelf pitchers in the bullpen stand to lose games for the Padres before their better relievers will be able to save them. Top-level position players — 1B: Brandon Belt, 7, 4.4; 2B: Marco Scutaro, 12, 2.4; SS: Brandon Crawford, 14, 2.4; 3B: Pablo Sandoval, 14, 2.5; RF: Hunter Pence, 8, 4.1; C: Buster Posey, 2, 5.2. Totals: six players, 21.0 WAR. Second-level position players — Gregor Blanco, 101, 2.6; Juan Perez, 196, 1.1; Angel Pagan, 212, 1.0; Joaquin Arias, 219, 0.8. Totals: four players, 5.5 WAR. Top-level pitchers — Madison Bumgarner, 26, 3.9. Totals: one pitcher, 3.9 WAR. Second-level pitchers — Santiago Casilla, 176, 1.1; Tim Hudson, 180, 1.0; Jean Machi, 181, 1.0; Javier Lopez, 186, 1.0; Sergio Romo, 214, 0.7. Totals, five pitchers, 4.8 WAR. We always say the Giants will go as far as their pitching takes them. If that's true, based on these lists, the Giants can't go far. Starting pitchers Matt Cain, Tim Lincecum and Ryan Vogelsong aren't even on these lists. Their decline in 2013 explains plenty about how the Giants fell so far last season. If they can rebound, that changes everything. But we have to see it first. Good everyday lineup here with six players in the top half of their positions across the big leagues. And the Giants always bring fire out of their bullpen. Bruce Bochy is about as good as it gets for a field manager. And it remains that the Giants have won two of the last four World Series. See how it goes. Editor's note: All numbers in this piece are from or are extrapolated from Baseball-Reference.com, unless otherwise indicated.